For the town, see Stormsrivier. Storms River (Afrikaans: Stormsrivier) is a river in the Eastern Cape province of South Africa. The river mouth is located in the Tsitsikamma National Park. The 5 day Otter Trail starts at the Storms River mouth. 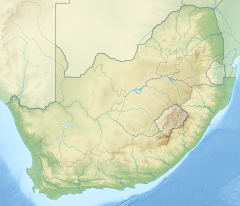 Wikimedia Commons has media related to Storms River. This page was last edited on 25 November 2018, at 03:49 (UTC).